Here are 2 ads I created for my Art Direction I course in Spring '09. The assignment was to portray our brand's message using communication devices we learned in class. We were to create 2 comps, each taking a different direction. I choose Fiji Water as my brand. My target audience was females aged 25-34. They are affluent , independent, highly educated, white-collar workers. 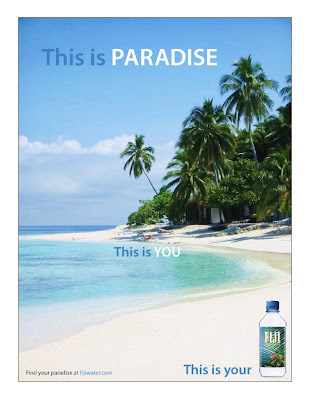 For the first ad titled "This is..." I utilized the image/lifestyle device to associate Fiji water with extravagance and leisure. 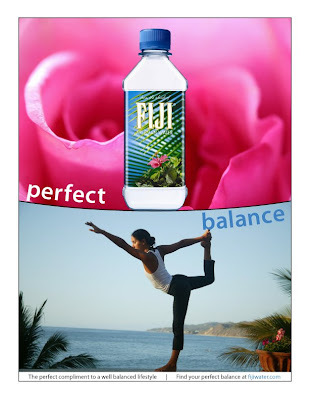 For the second ad titled "Perfect Balance" I wanted to associate Fiji water with the target's balanced lifestyle, and that Fiji water is the perfect water to compliment that lifestyle.